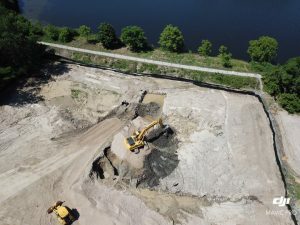 Take a look at this shot of the footprint taken from above. 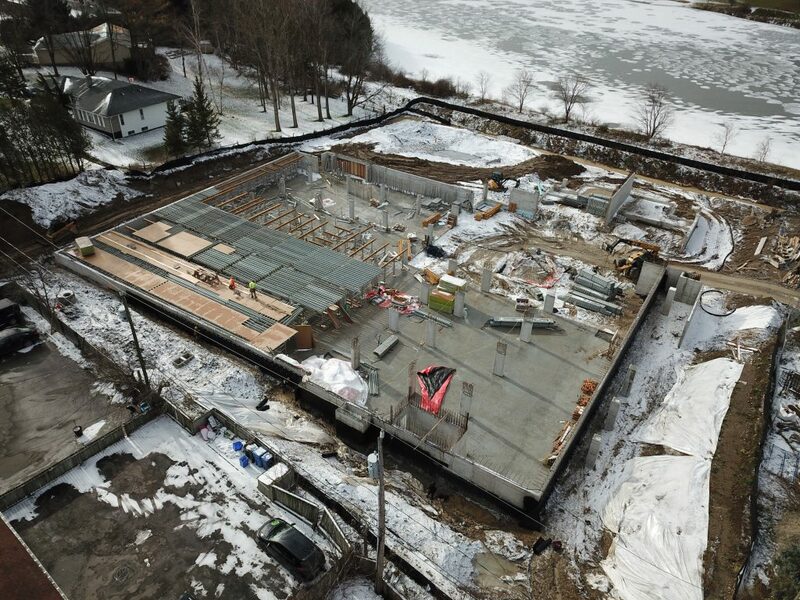 Stay tuned for additional birds-eye-view updates as construction continues over the next several months. Remember, this new condominium building is being built right in downtown Tottenham! With a brand new commercial centre right across the street, you are only steps from all your shopping needs like the LCBO, Pharmasave and Vince’s Market. 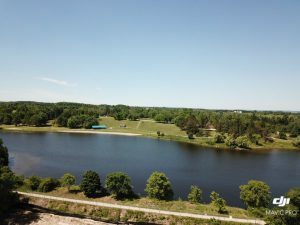 Contact Tina and Cheryl now to purchase a luxury condo with a view and downtown amenities – (705) 250-6900. Ever wondered what you could see from the top floor of Vista Blue? Look no further. With our new drone camera we are able to capture and convey to you the exact view you would wake up to every morning at your new condo in Vista Blue. The construction at Vista Blue has made some amazing headway in the last few weeks. Site work is complete and we have moved on to constructing the base of the building and parking structure. 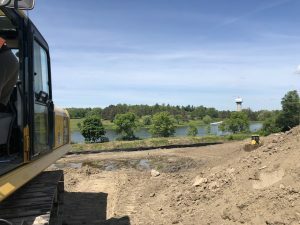 There will be lots of activity here in the next few weeks so keep your eyes on the property and look for updates on the blog as the next phase of construction begins! 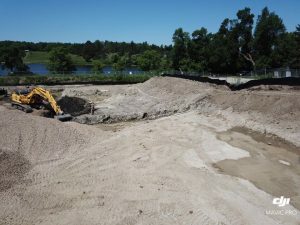 Take a look at the excavation happening here in Tottenham! 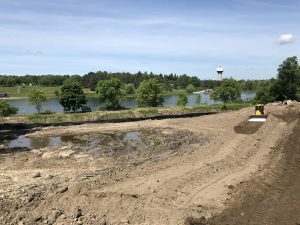 Now that site work is fully underway, it won’t be long until you can see real construction on the footings for the parking and building. Keep watching the blog for more updates! Site work continues and the property is really starting to take shape. Have a look at these views of the Tottenham Conservation Area from the ground floor and just imagine what they would look like from the 6th! This is your last chance to get pre-construction pricing! Call Tina and Cheryl today (705) 250-6900 and take advantage of this amazing opportunity to purchase in a building that is already under construction. 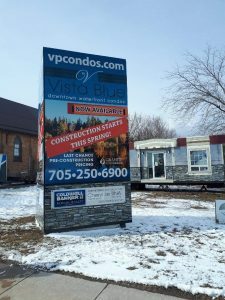 If you drive by the Vista Blue site in Tottenham this week, you are in for a tremendous surprise. 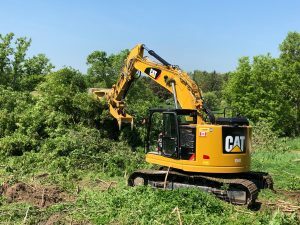 Site work has officially begun and much of the property is already cleared. 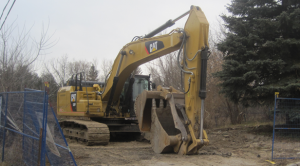 Take a look at this excavator in action and stay tuned to the blog for more picture updates as construction progresses. Call Tina and Cheryl at (705) 250-6900 to get your luxury suite today! Looking for big city amenities with great proximity to Toronto and Pearson International Airport? Look no further than Vista Blue, Tottenham’s premier luxury condominium development! There are still some excellent suites available now for purchase, and with construction starting this spring you can now watch your new building get built immediately! For more information on available suites and pricing please call Tina and Cheryl (705) 250-6900 or drop by the sales office at the Coldwell Banker office, Tottenham location. We are pleased to announce that construction is starting this spring at Vista Blue! Stay tuned to the blog for photo updates as site work begins – we can’t wait to see this building get under way! If you haven’t made your reservation already, our final release of prestige units is now available. Contact Tina and Cheryl at 705-250-6900 to reserve your new luxury unit in Tottenham! Congratulations are in order to the reservation holders in Tottenham as a long awaited Site Plan Approval has been granted to Vista Blue! Look for action at the site in the next few weeks and as always, stay tuned to the blog for photo updates. 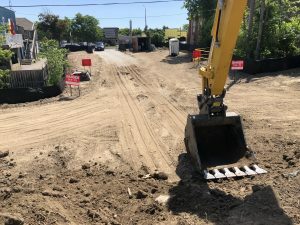 With the recent demolition of the existing building, site work at Tottenham’s first luxury condo, Vista Blue, is officially underway. We are looking forward to more advancements in site work through the winter, but due to the weather we are aiming to begin foundations in the spring. Stay tuned to the blog for updates on construction progress as well as the highly anticipated final release of units. For more information on units please contact Tina and Cheryl at (705) 250-6900. We are pleased to announce that we are submitting our final follow up submission to the Town of New Tecumseth this week! In addition, you may have noticed some work has already begun on the property as the demolition of the existing home is now complete. Look for more signs of site work before the New Year and get ready for this project to take off. 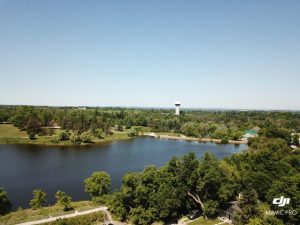 Our Final Release of units is coming soon – if you don’t own one already then call Tina and Cheryl at (705) 250-6900 for more information and reserve your new home now! We are pleased to release our most recent visualization of the Vista Blue building in Tottenham! Our team is looking forward to making your building a reality as soon as possible. Come live by the water and enjoy the sunset from your balcony patio! Call Tina and Cheryl at (705)-250-6900 to discuss reservations and pricing. The Final Phase of units is to be released soon! We are pleased to announce that we have made our next submission to New Tecumseth and we are waiting for comments. If there are no further delays in the site plan process, we should be able to begin site work within the next few months. Our team is very excited to be able to display some very tangible results of progress as site work begins. Stay tuned to the Blog for updates and some images as work begins. For information on reservations and pricing, please call Tina and Cheryl at 705-250-6900. Congratulations are in order to all the owners at Patterson Park as construction on their new building begins today! Keep an eye on the site and watch as construction progresses over the next few months, things are likely to be moving fast very shortly. 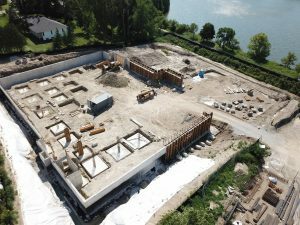 And if you are interested in keeping up to date on the progress of this project remotely, stay tuned to the Beeton Blog for regular updates on construction as the building comes together. For interested Vista Blue reservation holders, your building is not far behind! Stay tuned to this Blog for more information about the beginning of construction throughout the next several months. 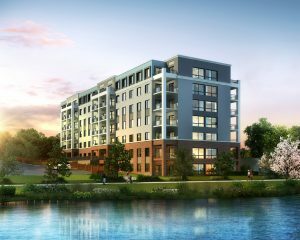 For your chance to own a luxury condo in the new Patterson Park building that is already under construction, or the Vista Blue building, call Tina and Cheryl at 705-250-6900 to discuss unit availability. Hurry! There aren’t many units left! Produced by CREATIVE ONE® | All contents © 2019 Vista Blue.